This is a die-cut Prairie Farms Butter porcelain sign. This particular Prairie Farms Butter sign is shaped and colored like a box of Prairie Farms Butter. 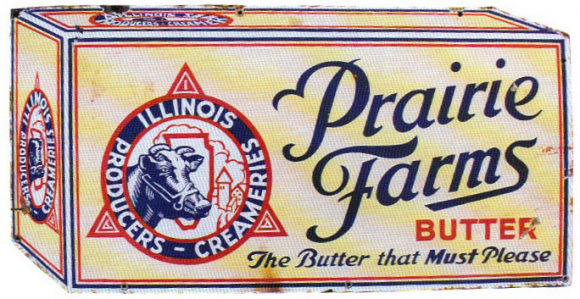 It reads, “Prairie Farms Butter, The Butter That Must Please, Illinois Producers, Creameries” and features a blue cow in an emblem on the left side of the sign.